This one is for those lemon lovers out there! 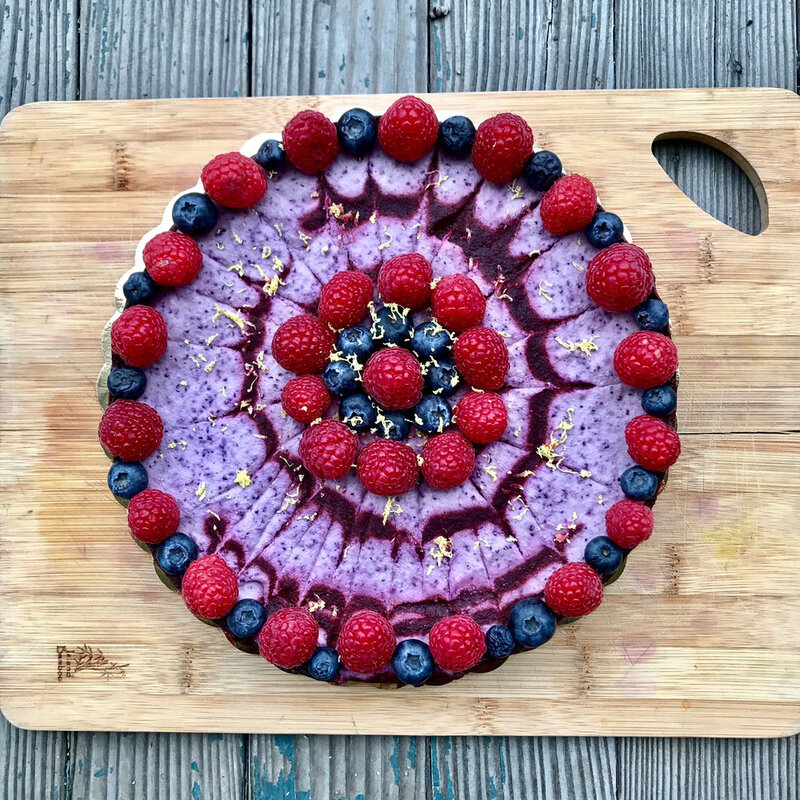 Similar to my previous cashew cheesecake recipes only this one isn't fermented, which means you can make it on the fly! This is the perfect recipe for spring. It's light, tart, and not overwhelmingly sweet. Plus who wouldn't feel amazing after eating something so beautiful? 1. Blend pecans into a fine flour. Add the rest of the crust ingredients and blend into a fine crumble. 2. Transfer to a 9 inch pie pan and distribute evenly. Use the back of a spoon to smooth it out. Place in freezer. 3. After soaking cashews for 3-8 hours, drain and rinse them. Blend them in a high speed blender until smooth. 4. Add in the lemon juice, 1/4 cup maple syrup, lemon zest and vanilla. Blend until smooth. 5. Slowly add in the melted coconut oil. 6. Taste and add more maple syrup if desired. 7. Scoop out enough to cover the crust with about 1/2-1 inch of the white filling (there should be some left over). Set in freezer for 30 minutes. 8. With the remaining filling, add 1 cup blueberries and blend until smooth. Spread the blueberry layer on top of the lemon layer. 9. Melt down 1 cup of frozen berries in a pot over the stove or in the microwave for about 3 minutes. Use a strainer to strain the berries (with a bowl underneath to catch the juice) smashing the berries with a spatula to get as much juice from them as possible. This is the berry drizzle that goes on top of the cheesecake. I poured the juice from the berries into a squeeze bottle and then swirled it on top of the cheesecake. I then used a tooth pick to create the tie dye effect! 9. Let freeze for about 2-3 hours. Then remove from the pie pan and have fun decorating how ever you'd like!